Anna University announced the last date to pay exam fees for November December 2018 exams. Kindly Share this details with your friends and seniors or passed out students. 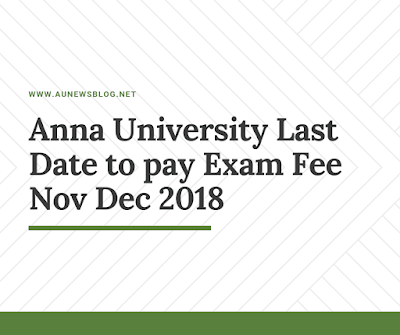 Anna University only published the last date for Regulation 2008 and Regulation 2013 Nov Dec 2018 exams. Regulation 2017 last date will publish soon. For faster updates join our Telegram group and Facebook Group. when nov dec 2018 timetable is going to release ?